UPDATE: Gizmos & Gadgets Kit 2nd Editionis now available and includes the Bluetooth Low Energy (BLE) bit and new littleBits invent app. The price of the kit has remained the same. 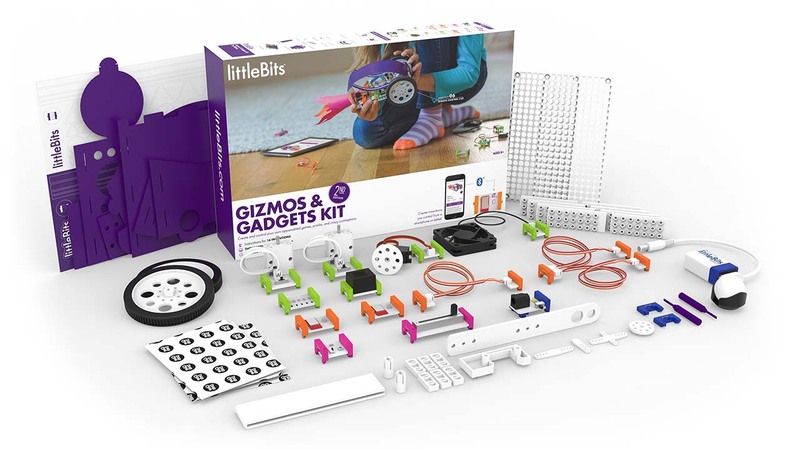 The littleBits Gizmos & Gadgets kit launched October 2015 and is available for purchase at $199.95. We took a closer look and discuss how it stacks up against our own littleBits sets and experiences so far. littleBits is a fantastic tool to get kids (and adults) creating and inventing with electronics. A bit like Lego bricks which allows you to build anything from buildings, to cars and spaceships, littleBits click together with magnets allowing you to build anything you can imagine. The new Gizmos & Gadgets Kit is a brilliant starter kit for families looking to develop STEM / STEAM skills and encourage problem-solving and creativity. UPDATE: The 2nd Edition Gizmos and Gadgets kit lost the wireless receiver and wireless transmitter, in favour of the bluetooth low energy (BLE) bit, which allows you to control your invent with your device. The Second Edition includes 13 reuseable electronic building blocks and instructions for 16 inventions. Compared to our Premium Kit which contains 14 bits, the biggest attraction of the Gizmos & Gadgets Kit is the accessories and the wireless bits. The buzzer, light sensor and bargraph bits are also not in the Premium Kit, but then it contains a sound trigger, pressure sensor, pulse and roller switch (not in Gizmos & Gadgets). It seems all the bits will be available to purchase separately, however their individual price is such that we think you may be better off purchasing the kit instead. I've printed off the Gizmos & Gadgets Inventors Guide to see how many of the projects we can try out with our own Premium Kit. Check back to see how we get on with our projects. What makes this kit better? We think this is a great starter kit to get you going with littleBits, especially if you are from a less geeky family and need a few ideas to get you going with your inventions. The booklet is packed with lots of ideas, challenges and customisations. The 12 projects listed vary from creating a car to a spinning lamp. The concept is that once you start building, new ideas will start to flow and before you know it, you've unleashed your inner inventor. The accessories in the kit makes it a lot easier to literally open the box and start creating. You can see wheels and a platform, put some bits together and wallah you have a mini car. We think this is so important, especially for busy families than need an activity they can pick up and do and not spend ages to figure out how to make something with it. With my own kids I find once they have achieved the first project they are much more inclined to try something different. The booklet is a fantastic improvement on previous littleBits instruction manuals. It is definitely does a better job in guiding you through the invention process, describing what each bit does and giving examples of what you can do with them. What's more they encourage you to keep on inventing and share your creations with the littleBits community via the mobile app. We really think littleBits is fantastic, our only criticism would be the cost. Individual components are expensive to purchase separately. UPDATE: The new BLE bit now allows kids to connect and control their inventions with their smart devices and transform passive screen-time into creative making time. The littleBits invent app becomes a personal invention advisor and helps create a new digital experience. We are at the start of an amazing age of innovation. Your kids is most likely going to be doing jobs in the future, we have not invented yet. Why not encourage them to build skills and be problem-solvers and creators for a future we are yet to discover. We love the fact that success with littleBits comes through trial and error. It is only when you try, fail and try again that you will create something magical.